Radiologic technologists are specially trained health care workers who assist physicians with such aspects of medical care as diagnostic imaging, cancer treatment, and sonograms. The Bureau of Labor Statistics reports that jobs in this field are on the rise and are expected to grow by 12 percent over the next decade. This is faster than the average for all jobs in the U.S., and West Virginia is no exception. Now is a great time to get an appropriate education and to seek employment in the state as a radiologic technologist. On average in the U.S. workers in the field of radiologic technology earn $29 per hour or $60,320 per year. In West Virginia, the average does not quite match up. Workers here can expect to earn an average salary of $48,280 per year or $23.21 per hour. With more experience, a higher degree, or areas of specialization, that salary can rise to about $65,000 per year or $31.25 per hour. With the cost of living lower in West Virginia than in many other states, the lower than average salaries are to be expected. More information on Rad Tech salaries in West Virginia. To gain employment as a radiologic technologist in West Virginia requires licensing through the state. 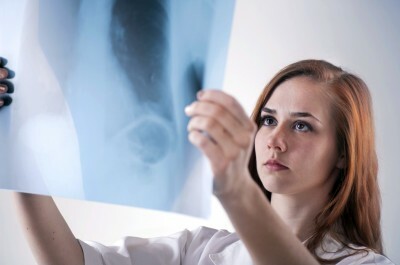 Radiologist assistants are licensed by the West Virginia Board of Medicine and other types of technologists by the West Virginia Medical Imaging and Radiation Therapy Technology Board of Examiners. The former are licensed for a two year period and the latter for just one year. Those seeking a license must first finish a course of study approved by the licensing boards and then pass either a state exam or the exam set by the American Registry of Radiologic Technologists. There are several locations in the state of West Virginia for receiving an education in radiologic technology including four-year institutions. West Virginia University Hospitals. This hospital system has its own educational program with courses of study in radiography, nuclear medicine, radiation therapy, ultrasound, echocardiography and magnetic resonance imaging. University of Charleston. This school offers a bachelor’s degree in radiologic science, which prepares students for licensing and employment in the field with both academic and clinical work. Students here also have the option of earning an associate degree in radiologic technology. Having this degree qualifies students to sit for the licensing exam. Bluefield State College, Bluefield. The School of Nursing and Allied Health offers an associate’s degree program in radiologic technology and a bachelor’s degree in imaging science. There are also some technical and community colleges in West Virginia with radiologic technology programs. Southern West Virginia Community and Technical College. The Mount Gay campus of this technical college offers a degree in radiologic technology, which can be completed in two or three years. Northern Community College. This community college offers students an Associate of Applied Science in Radiologic Technology, which prepares students to be entry level workers in the field. Mountwest Community and Technical College. At Mountwest, students may earn a degree in radiologic technology in coordination with the Collins Career Center. There are many choices for graduates of radiologic technology programs seeking employment in West Virginia. In addition to large hospital systems, there are smaller hospitals and medical centers. The leading professional organization in the U.S. for radiologic technicians and technologists is the American Society of Radiologic Technologists. In West Virginia, workers in this field may join the organization’s state affiliate, the West Virginia Society of Radiologic Technologists. Additional organizations at the national level include the American Registry of Radiologic Technologists. This is the group that sets the exam that many graduates will take before earning a license. Another national group, the Joint Review Committee on Education in Radiologic Technology accredits many educational programs and is a good source of information about schools and careers.